The first feature was easy. Bluefish already has zoom with ctrl-mousewheel, so I added the accelerators (it turned out that the requester was not aware of this feature). For the second feature I created an option that automatically hides all menu bars, status bars and toolbars on fullscreen (F11). It displays them again if you hit F11 again. This way basically every bit of the screen is used by the editor itself. The only issue I found is when LXDE is used. LXDE has bound F11 to the window-manager fullscreen, so the application fullscreen never gets called. I moved my code to the configure event handler, where I can detect both the internal fullscreen as well as a window manager fullscreen. The third feature was the hardest bit. 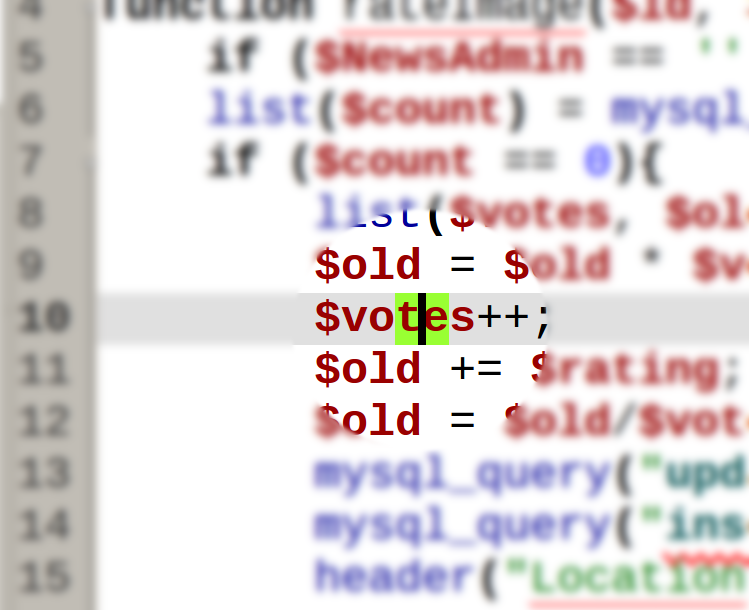 With some help from IRC I managed to make the cursor-aspect-ratio user defined. Next to a bigger cursor I made a setting to highlight the cursor position: it paints a differently coloured background on the character left and right of the cursor. I connected that to the mark-set insert-text and delete-range signals, the last two with g_signal_connect_after() to get the new location of the cursor and not the old location. What this code causes is an update the internal structure of the GtkTextBuffer (probably something like a balanced tree) that keeps track where each tag starts and stops – for every cursor move. After rethinking this I remembered this is much easier done in the expose event! The result is visible below. So now it is test time!